This incident took place while Luis Suarez was playing for Dutch giants Ajax. It all started when Ajax’s Rasmus Lindgren was sent off in the last minutes of the PSV Eindhoven draw against Ajax. 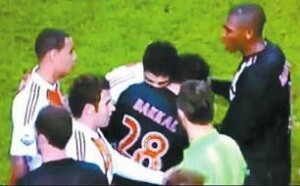 Players from both sides gathered near the midfield line, and that’s when Suarez appeared to attack PSV’s Bakkal. Ajax suspended him for two games and fined him an undisclosed amount but the The KNVB increased Suárez’s suspension to seven league matches.